Though Chrome Web Store is already in operation for a long time, even before it was “opened”, the Google Browser has supported the installation of extensions. At that time, extensions were made available directly to the sites of their developers in a file format with the CRX. Still today, you can still find some chrome extensions that are downloadable off the Web Store in its original format. Below, we have prepared a tutorial explaining how to install Chrome Extensions outside Web Store Offline manually using .CRX File. 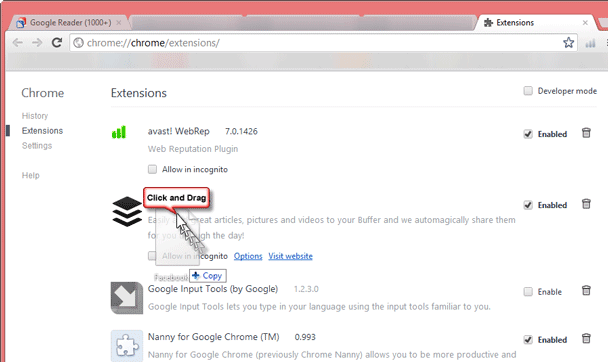 Now, “drag” the Chrome Extension File (CRX) to the Chrome window. On the other hand, if the system already recognizes the file as an extension of Chrome, you can simply double-click to open it. Regardless of the way you open, there will be a confirmation box at the bottom of Chrome Window where you have to click “Continue” button. Small Window appears whether you like to Add an Extension or Cancel. Just a Click on “Add” button installs the chrome extension offline successfully. Method of installing Chrome extensions manually using CRX file offline is useful when extension isn’t available in Chrome Web store. This may be because of not following Terms and Conditions or maybe unsupported or illegal. In such case, if you want to test and see the extension out of curiosity, method proves to be useful. Also, you may download Chrome Extension (CRX File) From Web Store without installing it. Note: Chrome Extensions available for download outside Web Store aren’t always trustworthy. They aren’t tested so, you are more exposed to risk of security and incompatibility issues. As far as possible try to find alternative to the extension in Web Store and install Chrome Extensions offline only if there is no alternative option.